Ahed Tamimi (dubbed Shirley Temper by Israellycool) is a 16-year-old Palestinian ‘activist’ from the West Bank town of Nabi Saleh who’s been exploited by her parents for propaganda purposes – which has included encouraging her to attend violent protests and provoke Israeli soldiers – since she was a young girl. The Guardian reported today on charges against Tamimi for assaulting security forces, incitement and throwing stones based on an encounter filmed last month which shows her hitting and provoking an Israeli soldier. 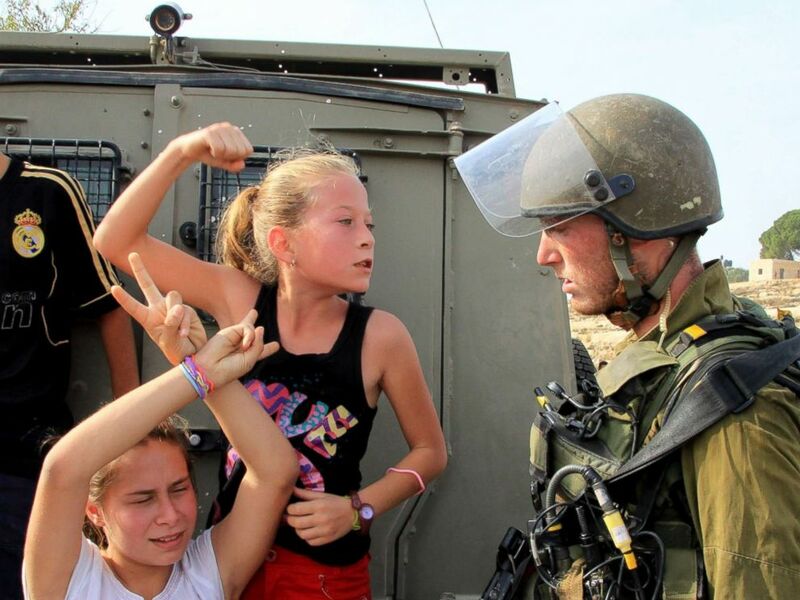 Ahed and her mother [Nariman] were charged in relation to the incident and to remarks broadcast in the immediate aftermath, in which Nariman asked her daughter to give a message to the world. According to the prosecution, Ahed said she hoped “everyone will participate in the protests”, in comments that the prosecution claims also endorsed violence. However, Beaumont fails to include the rest of the quote by Ahed which helps explain why the prosecution “claims” she endorsed violence. “I hope that everyone will take part in the demonstrations as this is the only means to achieve the result,” [Tamimi] said. “Our strength is in our stones, and I hope that the world will unite to liberate Palestine, because [Donald] Trump made his declaration and [the Americans] need to take responsibility for any response that comes from us,” Ahed added, apparently referring to the US president’s decision last month to recognize Jerusalem as Israel’s capital. Beaumont later uncritically cites Palestinian comparisons of Tamimi to the Pakistani Nobel Peace Prize Winner Malala Yousafzai, an absurd claim given that the Pakistani teen, shot in the head by a Taliban member for supporting girls’ education, is an outspoken supporter of using only non-violent means to overcome injustice. The Guardian report, through their egregious omission, and legitimisation of a risible comparison between Tamimi and the Pakistani heroine, obfuscated the Palestinian teen’s disturbing support for murdering Israeli civilians – representing yet another example of the media group’s ongoing efforts to whitewash widespread Palestinian support for violence. It is certainly a serious omission, as the full quote given by the Times of Israel does call into serious question the character and credibility of Ms. Tamimi. The other point I noticed in the article in The Guardian is that there are those who are comparing her to Joan of Arc. So they believe that she is going to be sold out by her own side who will not lift a finger to rescue her? Deep thinking isn’t an anti-Israel trait. In today’s Guardian Harriet Sherwood wrote a an article very sympathetic to Ahed Tamimi that basically turned her into a saint and a hero. In any other Middle Eastern country assaulting a soldier would likely result in being shot on the spot. This was a carefully staged provocation. Her parents are kvelling over her and advocating murder and suicide bombings to liberate Palestine. I hope Ahed and her parents get locked up in the same cell for a long time. …along with Harriet Sherwood. Maybe Mrs. Tamimi will do Harriet’s nails. Sherwood is a vile dreg writing for a cageliner. What are you babbling about tthis time? It’s only fair to point out that when these child stars grow up it’s almost inevitable that their acting careers go straight downhill. Peter Beaumont will always have fond memories of the young “Shirley” kicking, hitting, and biting people. So cute. Watching the video for the umpteenth time, I would suggest that the Tamimi family, and all the Palestinian propaganda ‘specialists’, probably regret posting it as to any rational observer, the Israeli soldier behaves with exemplary calm and dignity in the face of continued provocations.